I bake Dorie Greenspan’s French Yogurt Cake (p 224 in Baking From My Home to Yours) over and over again., each time varying things just a bit. Why? Well, the basic recipe calls for ingredients I almost always have on hand (plain yogurt, ground almonds, lemon, eggs, vanilla, etc. ), and it can be mixed in a single bowl with just a wooden spoon. Thus, when the mood for cake strikes, I can have it in the oven in just a few minutes. 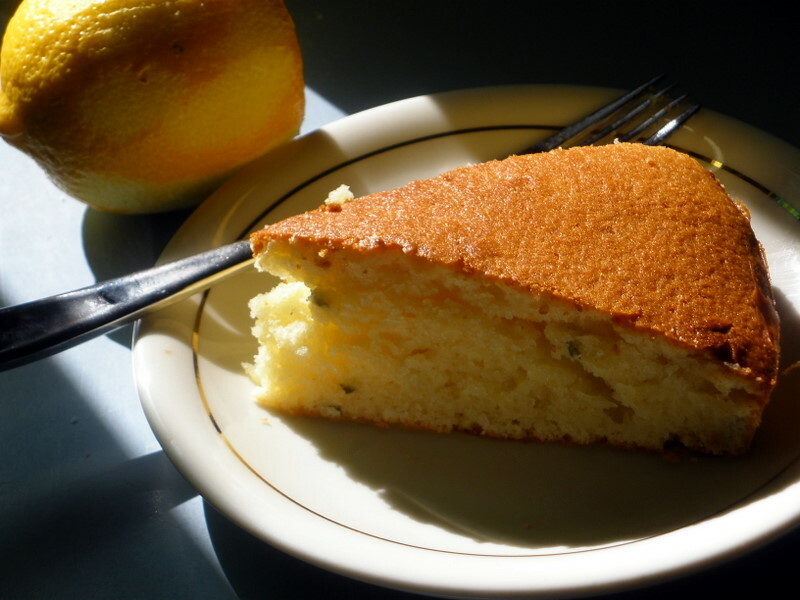 This time, I (mostly) followed her “Riviera Yogurt Cake” variation (p 225), which calls for Greek yogurt, extra-virgin olive oil, and chopped mint, as well as the usual lemon zest and vanilla. The resulting cake, nutty with a hint of mint, reminds me of the breakfast cakes found all over southern Italy. It is very good plain and even better when split, toasted, and spread with lemon marmellata or jam. The recipe makes a single, 8 or 9 inch layer…and I baked it in the toaster oven. My not-so-new-now toaster oven is large enough to hold a round cake pan, and it also has a convection feature. So the cake baked in 7 fewer minutes than expected; a nice bonus in my rapidly-getting-too-hot-to-bake kitchen. It is delectable, and very easy to make. Plus, it’s toaster-oven friendly. What’s not to like? Are almond flour and ground almonds the same? What brand do you usually get? I can’t stop thinking about how much I want this cake. Almond flour & ground almonds can be the same, but sometimes ground almonds are coarser in texture than almond flour. The original instructions in Greenspan’s recipe (see Google Books for it) call for ground almonds, not almond flour. I’ve been using Bob’s Red Mill almond flour, which has a rather coarse texture. Other brands are more finely ground, almost powdery–the kind used for french macarons or as a wheat-flour replacement in gluten free baking. I made muffins. Yum. Tried to go to the mexican place La Palmas (sic) in Thibodaux on Monday. They were closed as was half of town. Next time.